We’re please to announce we have recently invested in a revolutionary piece of diagnostic equipment that can detect a number of common eye conditions, such as glaucoma, age-related macular degeneration (AMD) and diabetic retinopathy, during a routine eye test. This piece of equipment is called a 3D Optical Coherence Tomography system (3D OCT) and is manufactured by the world leading optical equipment manufacturer, Topcon. What is OCT? Ocular Coherence Tomography is an advanced eye scan for people of all ages. Similar to ultrasound, OCT uses light rather than sound waves to reveal the many layers that make up the back of the eye. This particular 3D OCT unit captures a digital photograph of the inner surface of the eye at the same time, so that areas of concern identified by the scan, can be cross-referenced with the classic view of the back of the eye that your optometrist sees. In other words, if you are looking at an iced cake before it has been sliced, you don’t know if it contains jam, cream or chocolate layers; equally if it’s lumpy or smooth. With this unique NON-INVASIVE technology we are able to see both the surface of the back of your eye (the top of the cake) and a three-dimensional image of the layers that are beneath the surface. Never before has it been easier to locate and identify eye conditions that affect the layers below the surface. 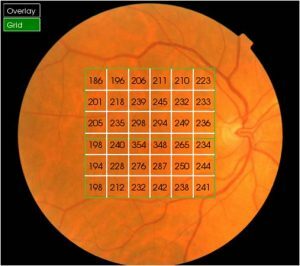 Your optometrist can then review the images on a PC screen and pin point areas of concern. Using this machine, we can more confidently diagnose, manage or refer you to an eye doctor for further treatment, should this be required. For the majority of patients, OCT provides significant reassurance that the deeper layers of their eye are healthy. Thriving to provide the best eye care, we can now provide this state of the art diagnostic tool with your eye test, if you so desire. There may be an additional charge for the OCT scan, but the benefits are obvious; you can enjoy the peace of mind that comes from knowing that your eyes are in great condition. Make sure that when booking your next eye test, you ask about an OCT scan.